Recurring drought is a way of life in California. Many experts believe our state will likely experience more frequent and severe drought in the future due to climate variability and growing water demands. Is this the “new normal” for California? How are local and state leaders and policy-makers preparing for a water crisis and how can citizens help our state become more drought-resistant? 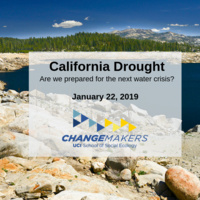 Join the Social Ecology ChangeMakers and Water UCI Director David Feldman, as he discusses the research on this critical topic and how drought lessons from around the world could help solve California’s issues.